Posted on 22/07/2010 by Allie. 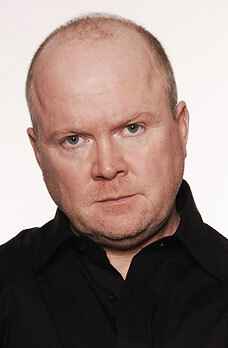 What comes into your mind when you think of Steve McFadden? “Who the crusty balls is that, Allie?” probably. Well world, I shall tell thee. Sir Steve God Amongst Men McFadden is an actor. He plays Phil “Hardnut, Dad of a Ginger Gay” in Eastenders. Wouldn’t want to mess with that, would you? Oh no. Oh-ho-ho no. You trouble King Phil Mitchell and he’ll be all up in your grill wheezin’ and smelling of vodka mumbling something about Grant and needing to get back to The Arches. But what do you think of the man behind the character? The man, the teddy-bear, the legend? Did you know one of his daughters has the middle name Tinkerbell? No, neither did I. Did you know he has a Politics A-Level? Nope, me neither. Did you know he left Eastenders for a year in the early noughties to concentrate specifically on pantomimes? NO? Me bloody neither! This man is like an onion; so full of layers. Posted on 12/07/2010 by Allie. Not cool, Switzerland. Not cool.